I’m-a bee, I’m-a bee, I’m a freakin’ bumblebee. View the whole set on Wowhead. Yellow’s not exactly in my comfort zone, but combining Grunt’s Chestpiece with Felscale Gloves is my happy accident for the week. 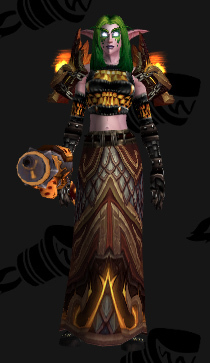 Here’s the full set on Wowhead. Tired of your wardrobe’s over-reliance on black? If you’re a warlock looking to step out of the shadows and into something with a lighter rustic flare, look no further. Sure, not even the most beautiful tailoring will be able to make your guildmates forget about your pacts with the darkest of demons, but when you’re wearing Stonecloth Robe you’ll be the talk of the druids — and this time not because of your terrifying command of the forces of darkness! And if you’re worried that a granola-eating, walk with the Earthmother set like this one “just isn’t you,” never fear: the skulls on your shoulders will make you feel right at home. 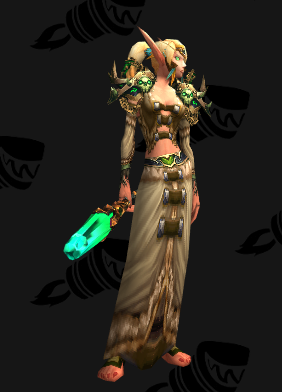 Okay, please don’t ask me what I was drinking when I went and labeled all the image files “cloth transmog.” This is a set for monks so, yeah, we’re talking handworked animal skins, not floral cotton/silk blends. 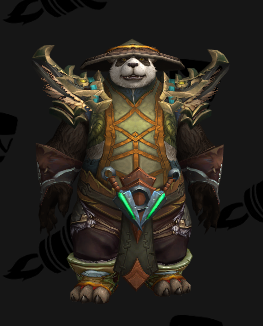 And speaking of monks, I’m so happy with this set, you have no idea. It’s not so much that I even like the look, though I do, it’s that it looks like something a monk would wear. Because they’re a (comparatively) new class, I sometimes struggle with the monk aesthetic. I know what a druid looks like. I know what a rogue looks like. But what a monk looks like, when he’s not wearing that classic limpet-shell hat? No freaking clue. But this set, this works! This looks like a — oh, he’s wearing the hat, isn’t he? 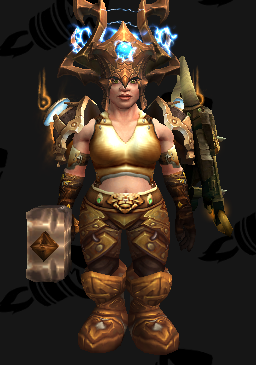 Now, because I was on the ball back when I first put this plate transmog set together, I went and selected Exceptional Crystal-Plated Greatbelt as the belt, despite the fact that it’s probably the hardest iteration of that belt model to get. 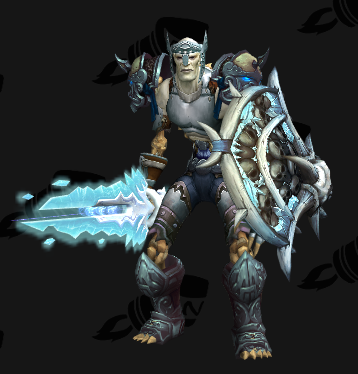 If you like the look, save yourself some grief and trawl through the alternates on Wowhead. I’ll admit, though, I’m frustrated about the lack of consistency in the shades of gold. The boots, for example, work on a dwarf because of her shorter stature, but when the taller races are in play I’m not sure the proportions still work. I’m also not 100% about Protector of Frigid Souls. Ugh. Anyone have any better ideas? Let me know in the comments.